I hope you are enjoying your Easter Weekend. I am taking some time to reflect on the meaning of the season and all that JESUS CHRIST has done for me... The weather here in Alabama is a bit rainy today, but yesterday was gorgeous with a high of 81 degrees. Not sure what it was in Wisconsin, but we were able to enjoy the great out doors here yesterday! 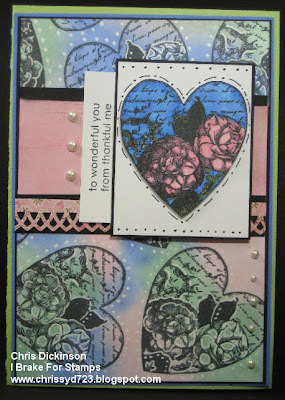 This is a card I made for the Technique Junkie Newsletter using the Scored Diamonds technique. I just love the affect it gives to the card! The stamp is from Firecracker Designs By Pamela and it is called Forgive Me. Hello! It has been a CRAZY, CRAZY week and I have to say I am feeling like I am in a FUNK! Today is Belli Challenge Day!!! This week's Belli Challenge #88 - is to use COLOR SPRAY - this can be a home made mixture, Glimmer Mists, Walnut Ink sprays, a bottle filled with hairspray, reinker, and Pearl Ex, or even airbrushing with your Copic markers - whatever you desire! Here is a small recipe for you: fill a spray bottle with water and a drop or two of reinker til you get the color you want. HERE are some tips when using your Glimmer Mists. 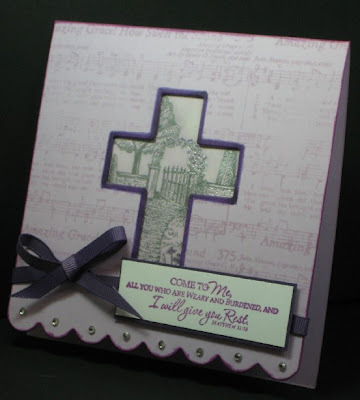 This week, we are blessed to have The Stamping Boutique as our Sponsor. 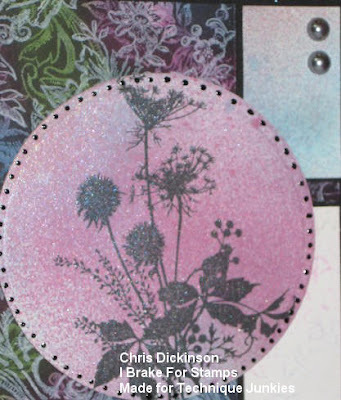 I have a few cards half finished using more of their FABULOUS digital images. 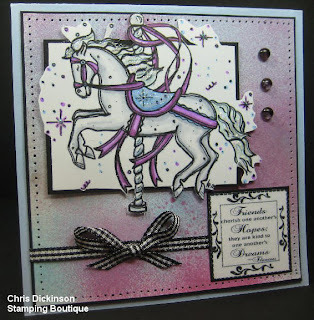 This one uses their Carousel Horse - I just LOVE it!!! 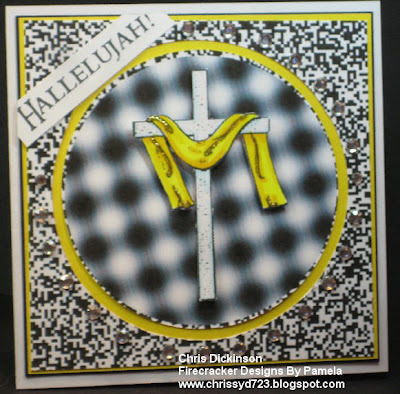 The challenge this week is to make a monochromatic card. Choose any one color of choice along with any neutrals and go for it! For more FABULOUS projects check out the BELLI CHALLENGE DESIGN TEAM projects and don't forget about the Blog Candy on the top of my blog! Thanks so much for stopping by! Have a great day! Hello and welcome to the Technique JunkiesTechnique By Design Challenge Blog Hop. You can have an opportunity to win a variety of products from Technique Junkie's FABULOUS Vendors! 1. Follow the sketch...The sketch uses Six 1-1/2" pieces; three sets of two different technique or cardstock pieces. 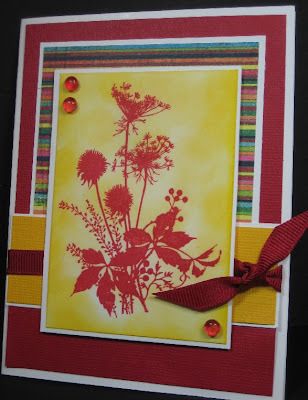 This is a great way to incorporate technique backgrounds into your cards. 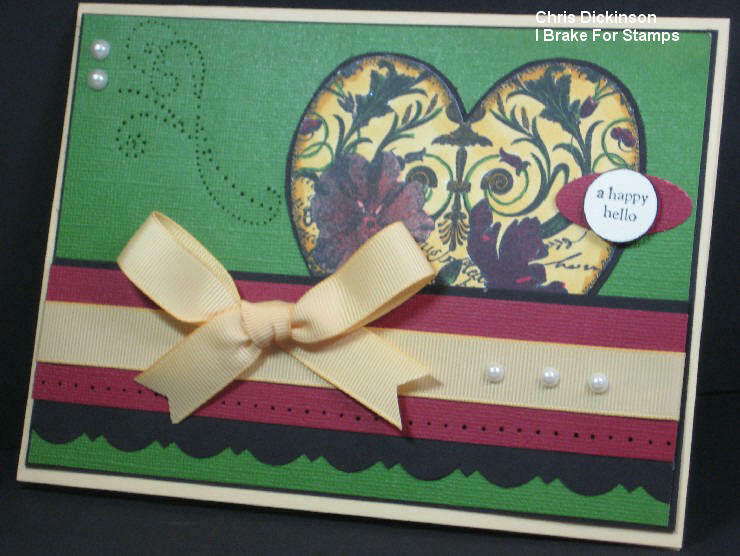 Just make sure the colors coordinate and you can mix and match different techniques on your card with a stunning effect! 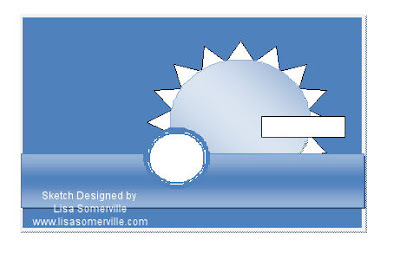 If you make extra backgrounds when trying out the techniques, you will love being able to use them here. Note: in order to qualify for the drawing, at least two different TJ techniques must be used on the card, and one of those two techniques must be used on the squares. 1. If you are a Technique Junkies' Subscriber you follow the Technique By Design Directions HERE. If you are NOT a subscriber, this link will not work without a pass word. 2. Post a link from your project to Pat's Blog by May 15th, which is the deadline! Did you know? YOU can CLICK HERE to save 10% at I BRAKE FOR STAMPS by using this code: SAVE10CHRIS OR if you are a Technique Junkie you can save by using their Vendor discount code! Now here are the links to all of your destinations you will NOT want to miss! Hetty - GO HERE NEXT! Thanks so much for stopping by and leaving a comment! Enjoy your hopping trip as you get INSPIRED for your challenge project! Have a wonderful day! BLOGGERS CHALLENGE: It's a Sketch! Hello! Today is Bloggers Challenge day and this week we have a sketch! You can see it below! I just love seeing everyone's different creations on these challenges. There are so many different styles and everyone's creations always inspire me to try something new. You can see all of the other Blogger Challenge participants by clicking on the Blogger Challenge icon on the side bar. 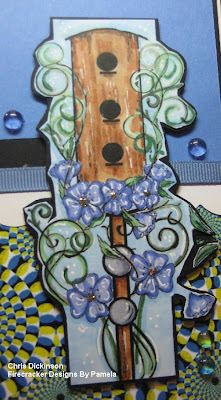 Once a month, Lisa Somerville (the Blogger's Challenge mom) challenges the group with a sketch challenge. I LOVE sketches and this one was FUN to create with! Happy Thursday! Even though I recently went away for a few days, lately I am finding myself being tested more and having a lack of patience. My children have been so energetic and I might add obnoxious, and that does not really bode well when I do not get enough sleep. As I write that, I am so thankful for the grace of GOD and all that HE puts up with me. He doesn't need sleep...I am confident that He looks at me at times and just thinks how obnoxious I am! Ephesians 1:6-8 To the praise of his glorious grace, which he has freely given us in the One he loves. In him we have redemption through his blood, the forgiveness of sins, in accordance with the riches of God's grace that he lavished on us with all wisdom and understanding. Thank you for coming by and taking a closer look and commenting! Have a blessed day! Hello! If you are coming here from a Direct Link - I have Blog Candy HERE. It is almost up to the 50's here in Wisconsin! I would really love it if it were at least 70 - but no warmer than 85 with NO humidity! For me, that is perfect weather! Todays card uses a few different challenges. 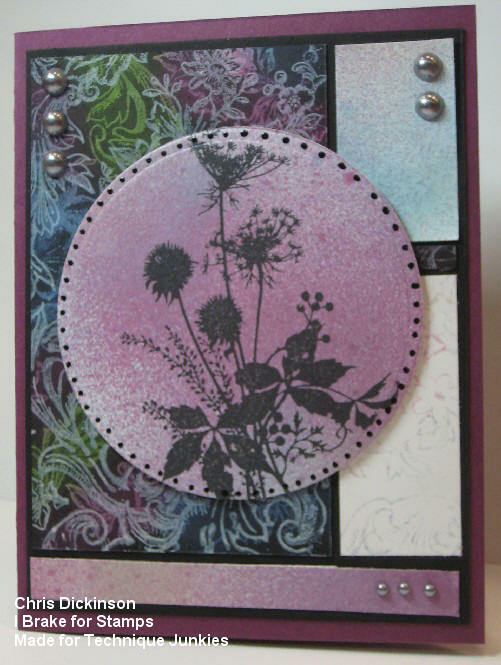 The first one is the Splitcoast Stampers Sketch Challenge #273 and the second one uses Mo's Digital Pencil Challenge #23 - which is to use three different punches! Thank you for taking a closer look and for taking the time to comment! I appreciate your kindness! Have a blessed day! Hello! Today on Splitcoast Stampers is Color Challenge day, but you may not know that due to the website being down most of the day! 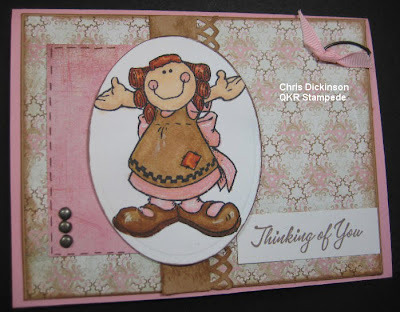 The Color Challenge was to use Dusty Durango, Lightest Pink and Creamy Caramel - and I made some time today to make TWO cards! Maribeth has just decided to start up a Design Team and everyone was announced yesterday/ and today. I am excited to be joining their team of other talented designers. They have a NEW BLOG, you can see that HERE - please take a moment to say hello to the New Team! 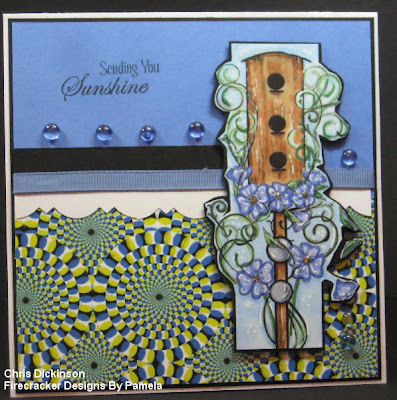 I used the BELLI CHALLENGE this week for inspiration on this card - it uses CLIPS and a SKETCH - check it out and join in the FUN! Hello again! I know TWO posts in one day! Can you believe it!? If you are coming here via a Direct Link - I have Blog Candy HERE. First off, upon my arrival to BLOG LAND I noticed I won TWO FABULOUS prestigious awards. That brought a BIG SMILE TO MY FACE!!! 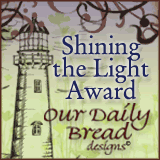 On top of those exciting Awards - I won a free stamp set from Our Daily Bread Designs! 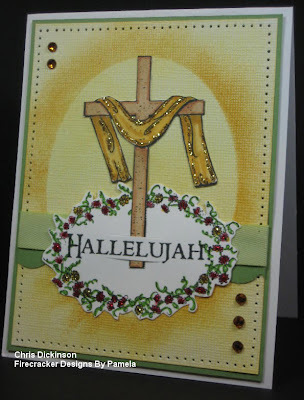 The card I am sharing with you today incorporates TWO challenges. I have TWO pictures because I couldn't decide which view I liked better so I thought I would go with BOTH of them. 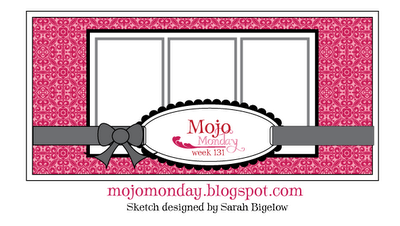 The first Challenge was the MOJO Sketch which is pictured above. 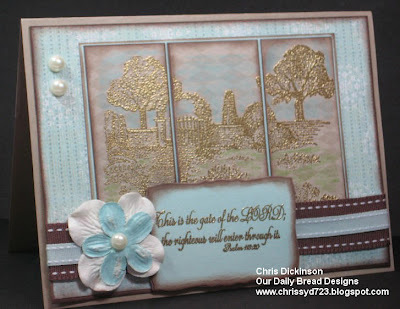 The second challenge was the Our Daily Bread Designs Challenge ODBDSLC6 - This week the challenge team is challenging you to Think Spring and New Life- Since this is the first day of Spring, create something for spring using Spring colors, sentiments and images portraying New Life. (perfect time for an Easter Creation being that we are new creatures in Christ). 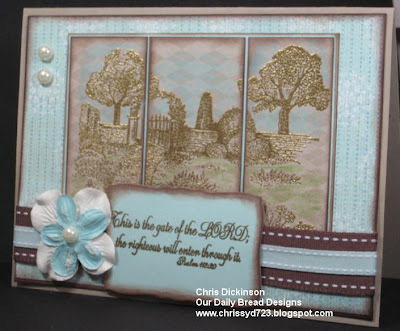 I embossed the Path of Life image from Our Daily Bread Designs on designer paper from the Western Sky Stampin' Up! - I love the Soft Sky paper and added a touch more color using Prismacolor Pencils to some of the embossed images. Have a blessed day! Thank you for stopping by! Hello! Happy Monday! Well, I m going with that sentiment and sticking it in my mind! I need to FOCUS on ALL of the GOOD THINGS. 5. I didn't watercolor - just sponged. SCRIPTURE Psalm 51:7-10 "Cleanse me with hyssop, and I will be clean; wash me, and I will be whiter than snow. Let me hear joy and gladness, let the bones you have crushed rejoice. Hide your face from my sins and blot out all my iniquity. Create in me a pure heart, O God, and renew a steadfast spirit within me." This also uses the Sweet Stop Sketch from last week! I will link this up a bit later today! Hello! 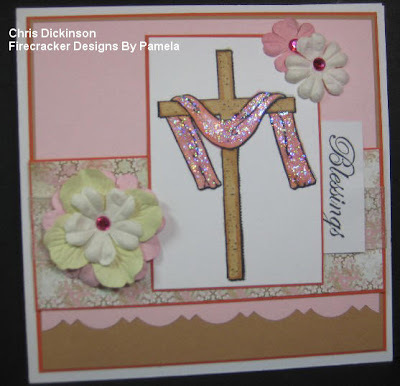 Welcome to the Digital D'Illusions themed Blog Hop forFirecracker Designs By Pamela and my Bloggers Challenge THINK SPRING project! 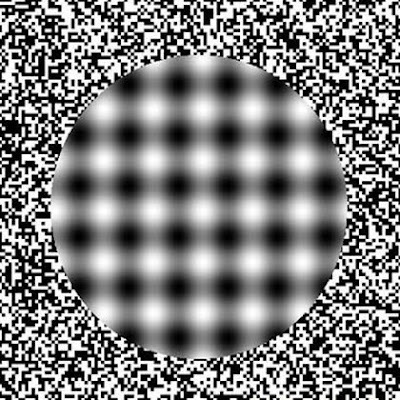 As I mentioned above, todays BLOG HOP has an OPTICAL ILLUSION theme... I had NO IDEA what to do, so I went to trusty GOOGLE for some inspiration! 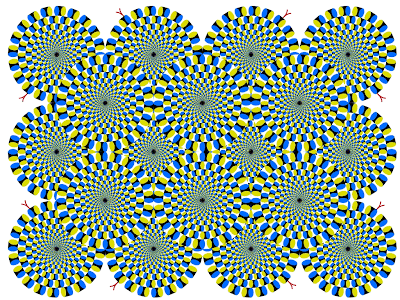 I typed in OPTICAL ILLUSION and soooo many ideas came to me - but I settled for this image. 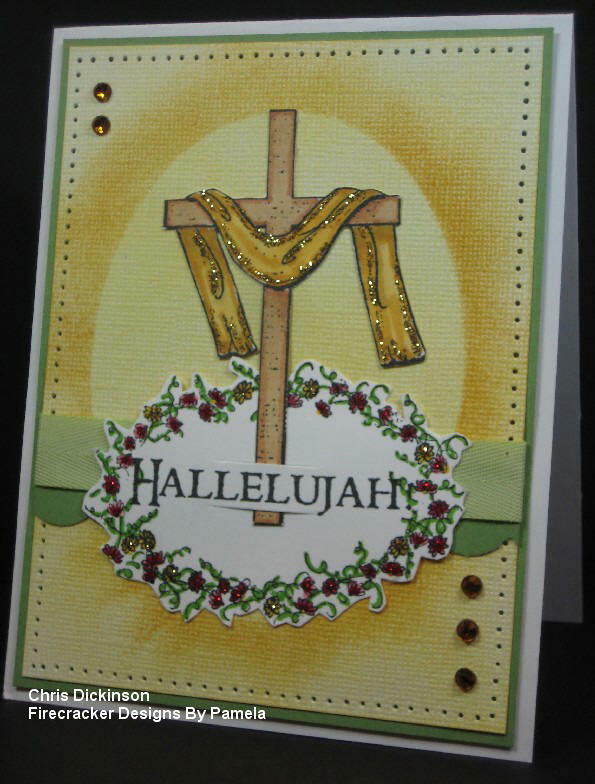 I printed it up, cut it apart and then added the yellow cardstock and the cross. 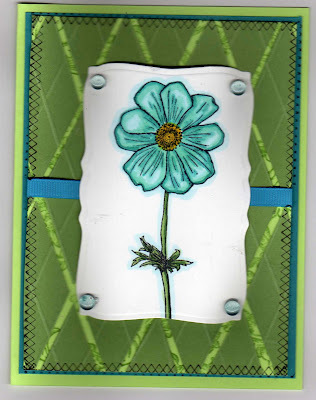 For the BLOGGERS CHALLENGE, we are supposed to THINK SPRING, so my next project will show that! Although for my family - we think of the Resurrection as the beginning of spring! 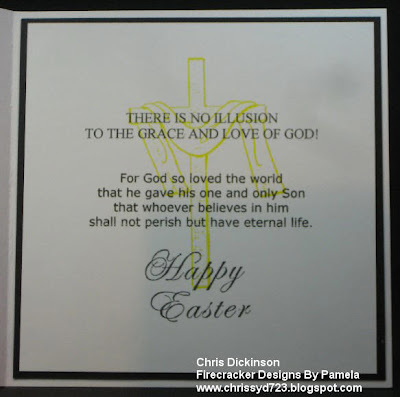 Details for the first project: Easter Blessings from FIRECRACKER DESIGNS BY PAMELA and the words on the inside of the card, I typed and printed ... the Happy Easter is part of the set! THe background is from Google! Stamps: Just Breathe from FCD too! BLOG CANDY!! One winner will be chosen from a mystery blog hostess…so you’ll want to leave a comment on EVERY blog so you don’t miss out! It’s like a treasure hunt inside a blog hop…he he he Prize this month?? 5 Free digitals!! For the Birds; Audrey; Giroid-Hey There! ; Manaone; Warm My HeartThe winner will be chosen from a mystery blog hostess that we don’t even know who it will be until the hop is over…so that’s why you’ll want to leave a comment on EVERY blog, so you don’t miss out! Now, to continue the circle, you will need to hop on over to the talented MICHELLE'S BLOG and keep going until you’ve come back to where you’ve started! Thanks so much for playing along with us and we hope you have a great time! Belli Challenge #87 ~CLIPS WITH A SKETCH! Belli Challenge #86 The EYELETS Have It!